You may remember that a couple of summers ago, the boys and I spent time studying the Renaissance. It's one of my favorite time periods. Pierce had the opportunity to go to a Renaissance camp this summer. It was a creative camp. He got to do leatherworking, cake decorating, and bridge building (although he refused to test his bridge with weights because he didn't want it to get busted). He also make a simple game using clay and beads. But his favorite thing, by far, was that they got to play around with building Renaissance architecture with Minecraft. Pierce just adores Minecraft. 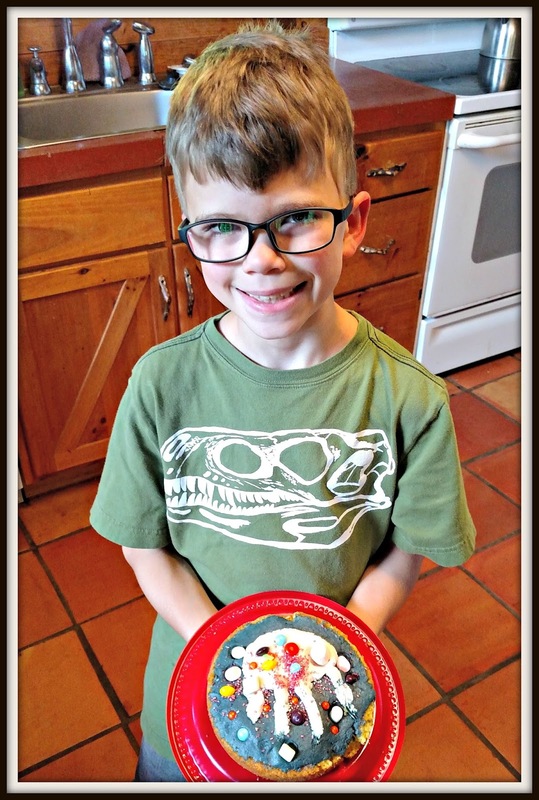 Here's Pierce with a cake he made. He said it's the first round table for the knights. Readers, do you have a favorite time period in history? You sure have cute kids. I went to a renaissance fair once but felt like it was more situated in the dark ages but maybe it was just me. Sounds like a neat camp, who knows what he will build at home now. I can see a blacksmith forge in the future. Sounds like a neat camp where the kids can be creative. I would like to know more about the Renaissance period. I don't know if I have a favorite time in history. I always enjoyed history in school though. So very cool, good job. I want to go to a camp just like that! i think i could say that the renaissance period was one of my favourites as well..
that cake looks delicious - well done hun!! That's one cute son with one cute cake! What a darling boy you have!!! I worked at a few renaissance faires and had a wonderful time but I love the Gilded Age--anything about that or the Jazz Age interests me. Ren Faires are always fun. Did he get to watch the jousting and was there an SCA pit there? What a great photo! Tell Piece he did good! We have been to a Renaissance Fair at Natural Chimneys. They have one there every year. I loved it. I guess my favorite time period would be maybe the sixties? Just because there was peace and love Hippies, and the Beatles made me happy. That decade was the end of our country's innocence. Looks like a lot of fun. My kids go to renaissance fairs up in the city they live in. They like the foods, the crafts, and the wardrobes people wear. I like the Roman Republic and Empire time frames. The Renaissance is one of my favorite time periods as well. Sounds like he had fun, with plenty to do. It sounds like fun! I like that they train with all those old things. My boys are in an outdoor camp this week. It was free, but they are fishing, rock wall climbing, water play, archery and more.